To help you explore Nice in one day I made a walking-route and marked it on a Google map. France tops the list for the most visited countries in the world. All of us want to see Paris, but go beyond that. Go to the French Riviera and Nice in the south-east. So wherever you choose to stay on the Riviera you should spend at least a day in Nice. Nice is the capital of the French Riviera (Cote d’Azur). It’s a city with narrow streets and a population of 350 000. This means traffic in Nice is slow. It’s so slow it’s best to walk. Leave your car in the Harbor (Le Port) or use one of the parking garages around Promenade des Anglais or Place Massena. If you can, come by bus or train – and start walking. My Nice in one day walking-route covers the area that has the most interesting sights for a first time visitor. On your second day you can see more and go to museums. This is what Nice looks like on the map. There is a harbor in the east and a hill with a former castle. 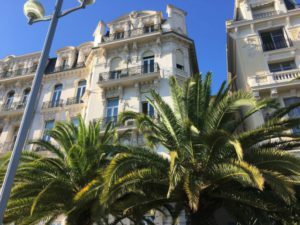 The old city lies on the foot of the hill and a long beach with the famous Promenade des Anglais follows the seashore all the way from the old town to the airport. You can see the walking-route on the map. 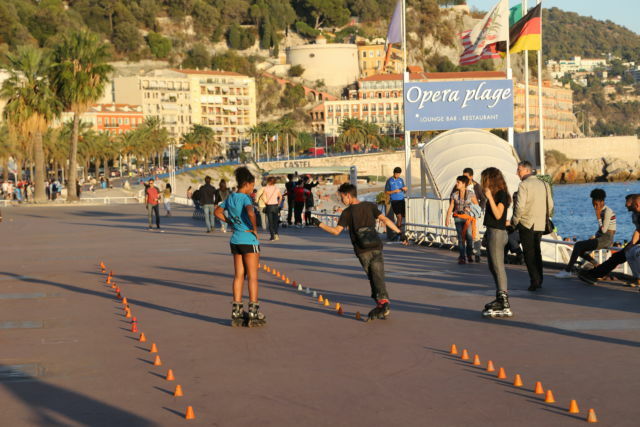 The route brings you to the old town, beach, Promenade des Anglais and the new city quarters behind it. This is an area where you can easily spend a whole day. We started our trip in the harbor. Nice harbor (Le Port) is pretty. There is a pretty row of buildings in different colors in a mountain setting. If your time allows, spend some time strolling in Le Port. In the morning the harbor is in the shade but in the evening when the sun shines from the west the harbor looks beautiful! The Old Harbor is a popular restaurant area so an evening in the harbor might be a good idea. From the harbor you can climb to the hill Colline du Chateau for great views of the city. You can either take stairs up from the Quai Rauba Capeu side (seaside) or from the other side. Despite of the name there’s no castle on the hill, the castle was destroyed in 1706. Instead there is a park. From the hill you can tell how long the beach really is streching along Baie des Anges (“Angel Bay”) to the airport. In fact Nice beach consists of 30 different beaches so you have a lot to choose from. You just have to know what you want. Some sections are quite deep in the sea and don’t suit if you have children but in between you can find less steep sections. The beach is partly private and partly public. There are 15 private beaches with beach chairs, umbrellas and facilities and free public beaches between them. The beach is one of the most characteristic features of Nice and has always attracted visitors to the city. So enjoy the beach and the famous seafront boulevard Promenade des Anglais. Promenade des Anglais is an exceptionally wide beach promenade with palms and other trees in the middle. It follows the Mediterranean seafront for 5 km. The Promenade was built in the early 19th century when English upper classes preferred to spend their winters in a mild climate. They built their mansions here and walked up and down the street. This is what the name comes from, the “Walkway of the English”. Today most of the the pretty buildings remain but the street has been occupied by eight lanes of cars. But that’s ok since they have left a huge walking-area on the beach side. The pictures show very typical buildings on the Promenade. Many of them serve today as hotels and the most famous hotel is Hotel Negrseco. Towards the hill Promenade des Anglais gets narrower. Houses get simpler, they are low and form a wall between the Promenade and the Old Town. The long wall of houses is called Les Ponchettes. Les Ponchettes has ateliers, cafes and restaurants and you can have a nice coffee or lunch in Les Ponchettes. Quai des Etats-Units with these low flat houses was the fashionable area of Nice before the Promenade was built. Still today it’s a nice area – and through Les Ponchettes walls you can get to the old town. So the old town, or Le Vieux Nice in French, is protected from the sea by the thick city wall Les Ponchettes forms. Protection was certaily needed in the old days. There are a few gates like this one where you can enter the old town. The first thing you come across in the old town is Cours Saleya, the main street with a daily flower and vegetable market (except Mondays). Here you can bargain the season’s local fruits and vegetables. In addition there is a good selection of other local producs such like lavender bags and Marseille soap in twenty different flavors. The lavender bags I bought on the market were fresher than the ones in old town shops. Therest of the old town is all pedestrian alleys between medieval pastel buildings. The buildings are high and the alleys narrow and winding so the sun doesn’t really get into the alleys and it’s shady most time of the day. Good in the heat of the summer, but causes problems if you want to take photos. This is a pretty balcony I’d like to sit on watching street life. And below this photo some street views. This is the Palais du Justice and in the next photo below is Place du Palaice, the busy market place where the palace is located. We will return to the old town after dark. Let’s first have a look at the “new town” behind the le Vieux Nice. The Italian style Place Massena right at the edge of the old town is the main square of Nice. The square looks very Mediterranean with its arcades and pavement stones in two different colors. This is where the shopping area begins. Avenue Jean Medecin is the main shopping street of Nice. On both sides of Place Massena there are parks that have been built on a river that has been covered over. River Peillon still runs through Nice but you don’t see it. River Paillon that divided the city in two parts has given way to a playground and a tramline. The river has also given way to a lush park called Jardin Albert 1er next to Promenade de Anglais. The park has a fountain and a cute old-time carousel that local children seem to love. But Jardin Albert 1er also has something that’s not fun to look at. The park is in the area where independence day ceremonies in July are traditionally held. Now there is a memorial of the July 14 attack. But let’s walk on and look at the sea. The Mediterranean is as blue as it always has been. People sit on blue chairs and look at the sea. Nice is one of the few cities in the world that has a great beach like this right in the city. What a luxury for the citizens! Since the beach is deep it’s good for swimming if you don’t mind waves. The beach must also be a good place for fishing. Fishermen start gathering on the beach after swimmers and sunbathers have left. This is one of the pretty gates leading to the beach, the old-style Beau Rivage gate. Promenade des Anglais is mostly somewhat crowded, but particularly after work people like to come to the Promenade and spend their leisure time there, in the Mediterranean way. Roller-scaters, walkers, joggers – and a constant flow of cars! After sunset it’s a perfect time to go back to the old town and sit down in a street cafe and enjoy the French Riviera atmosphere. 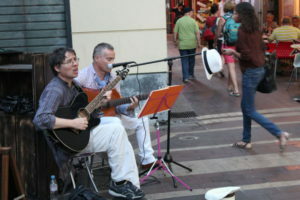 When you walk on, you’ll meet street musicians, performers – and why not do some shopping in the old town? 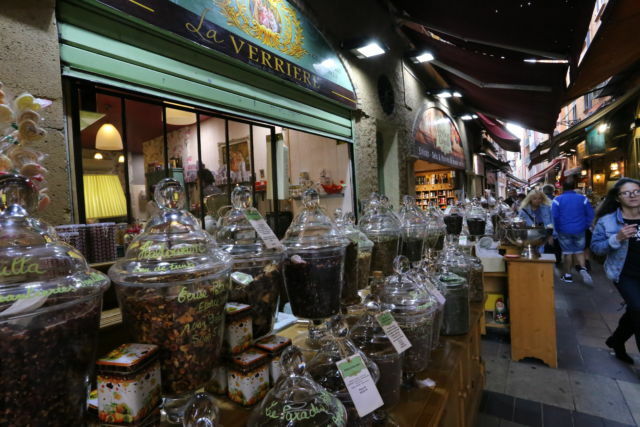 Stroll in the old town and enjoy the sights, sounds and flavors of Nice. I hope you’re unlike me traveling with more than just a small cabin baggage so you can buy the things you like. Putting limits your baggage size makes traveling easier but converts shopping to window-shopping. Can you see how narrow and high old town buildings are? Walking makes you hungry so it’s time to find where to have dinner. Hope you find a place where you can dine outdoors, the streets and squares are so pretty to look at while you dine. Sit down where typical Provencal dishes are served: Mediterranean fish, mussels, squid and you have to taste Socca, chickpea pancakes once you are here. And finally it’s time for the Place Massena sculpture to wave goodbye to you. We have seen Nice in one day. We have walked a lot but to be honest, there was no time for art museums yet that there are so many of in Nice. But that will be another day’s program.